A few months back, I decided to visit one of the first places that I had written a blog on, hoping to resavor their Moroccan dishes, but to my dismay, the restaurant was closed, and according to the gentleman outside enjoying his cigarette, it had changed ownership as it was preparing to open as another restaurant serving the same North African fare. 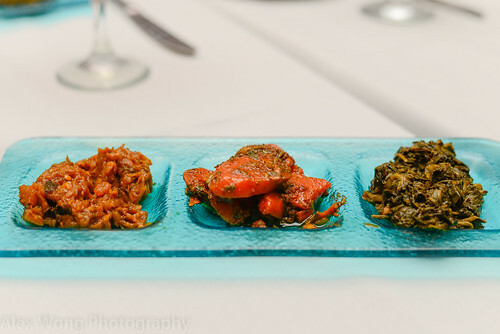 I was intrigued about the new establishment and the quality of its food on the upcoming menu. Well, a friend was going to turn the big Five-O. Not being one for pomp and circumstance, the reluctant one was not going to do anything to celebrate this milestone (What? Seriously?). Coming from a culture where one finds reasons for cause for celebration (including honoring the Winter Solstice), I took it upon myself to arrange a dinner for this fella. 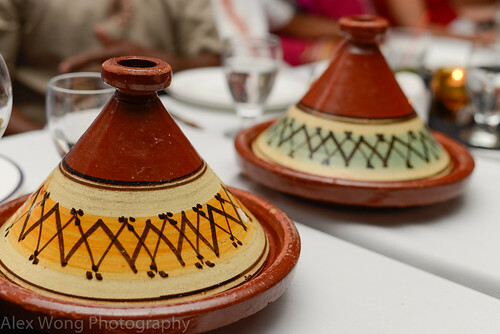 Knowing his affinity for Moroccan cuisine, I initially tried to make a reservation at a large venue that has been a local haunt for many years, until I found out that its shelf life had expired and the place was permanently closed, waiting for developers to raze it down and rebuild on that prime property. With few choices left, I corralled a bunch of his friends and we meet at Marrakech, in the Dupont Circle neighborhood of DC. 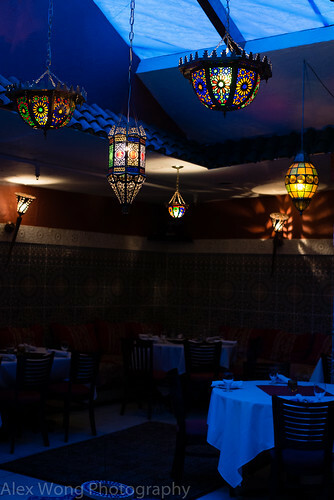 Walking into the establishment, I noticed nothing had really changed since its former identity as Marrakesh P St. Once everyone, including the celebrant, settled in, we decided to order the $35 8-course dinner. Here we go! 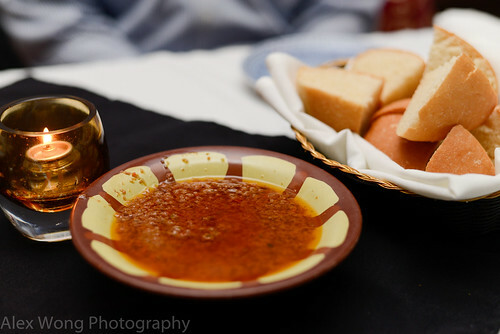 Appetizer: Olive Tapenade and Moroccan Bread: This was an awesome start with the moist fluffy bread making the perfect vehicle to sop up the slightly briny olive tapenade made sweet from finely grounded sweet onions, enriched by a layer of olive oil floating on top. I had to remind myself that this was not the first course yet, but I couldn’t refrain from dipping into this bowl constantly – neither could my friends. 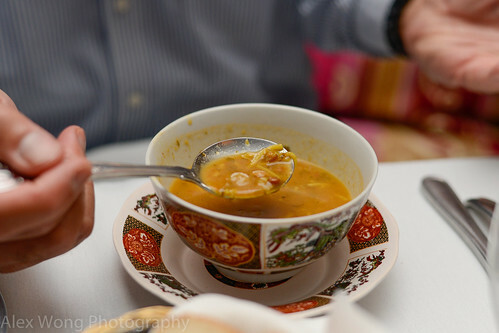 First Course: Moroccan House Soup. The bowl came with a broth filled with vermicelli noodles and a certain undistinguishable brown pea, similar to lentils. Most agreed that it was a bit under seasoned and it could have done with a spritz of lemon like how the former management used to serve it. The celebrant loved it though, he being a no-salt kind of guy. Second Course: Cooked Vegetable Salads. A beautiful glass plate arrived like a triptych of three paintings. Each little serving was a true delight and they individually were wrestling for the diner’s attention. The Eggplant was sweet and spicy without a faint of its bitterness. The Carrot salad was spiced by some coriander seeds, lemon juice, and bits of parsley, which complemented the amazing sweetness of this root vegetable. The Spinach salad was mild and devoid of any bitter flavors, made savory with a light spice seasoning that made it homey and soulful. This was a tantalizing trio indeed. Third Course: Chicken Bastilla. 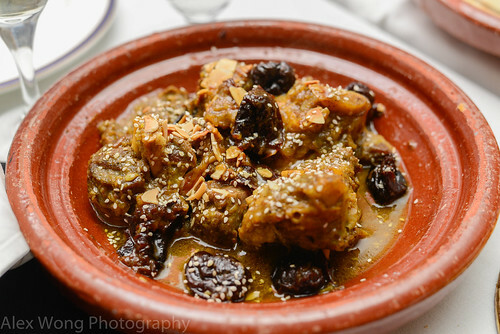 This festive dish is a good yardstick of Moroccan restaurant. The phyllo dough was crispy on the outside dusted with some powdered sugar and cinnamon. 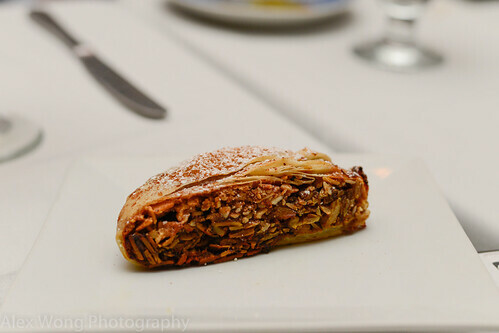 The moist filling consisted of bits of shredded chicken and almond slivers, spiced with more cinnamon. I quite enjoyed this dish with the savory-sweet flavor combination. However, I could not finish this wedge of pie since it was chockfull of nuts and I was getting a bit full already. Less nuts and it would have been perfect. Fourth Course: Lamb Tagine. The chunks of lamb were very savory from some spices and seasoning, and they were literally fork tender, which the celebrant raved about. Pieces of prune added a sweetness to the dish along with some fruitiness, while the sesame seeds and shards of toasted almond added some crunchy nuttiness to the dish. Amazingly, there was barely a single ounce of fat in the dish, indicating the quality of meat and the skillful kitchen. Fifth Course: Chicken Tagine. 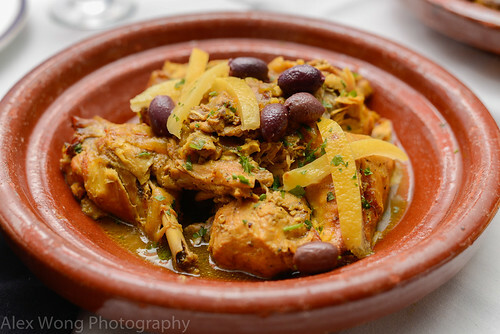 Pieces of tender chicken have been cooked in the Tagine earthenware along with spices and seasoning to add lots of flavor while retaining the meat juices. Bits of preserved lemon and olives add their brininess as well as their fruity flavors to the dish. 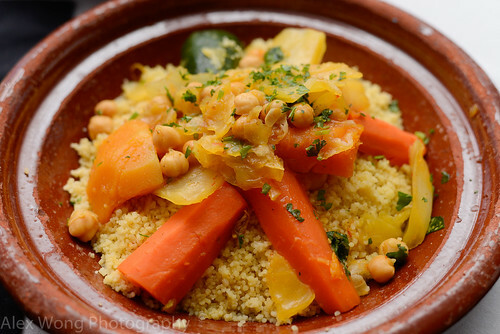 This is one of my favorite Moroccan dishes and they get it right here. Seventh Course: Mint Tea. 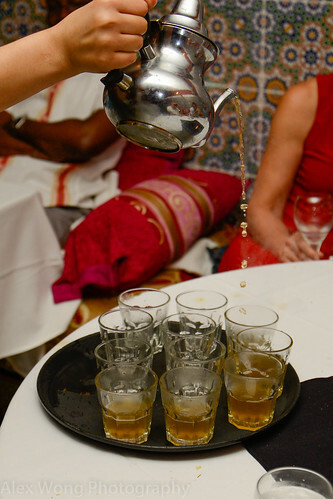 No respectable Moroccan restaurant will serve a meal without this cup of fragrant hot tea. It was poured table side and we enjoyed the spectacle. The tea was not too sweet and it had a hint of the mint essence. However, it was dried mint, of which I would have preferred the fresh version. Eighth Course: Orange Salad. The plate arrived with slices of orange that have been dusted with confectioners sugar and some cinnamon powder. 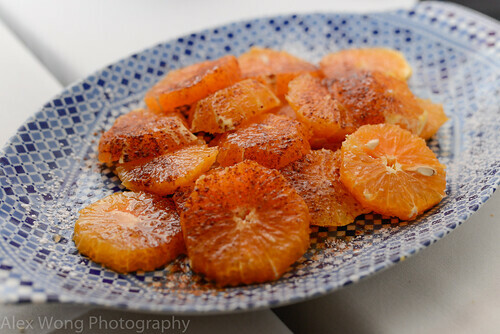 Taking a few bites, I would not have imagined that cinnamon went well with this sweet citrus fruit. A light hint of orange blossom water took this simple dessert to a distant place. Bonus Course: White Chocolate Strawberry Shortcake. Just when everyone thought dinner was over, I pulled out this surprise. 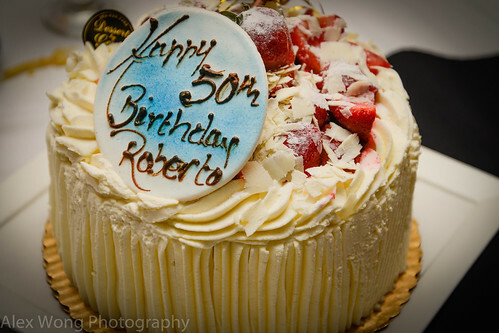 The cake came from Desserts by Gerard, hidden in an inconspicuous strip mall in Oxon Hill, MD, and run by the former pastry chef at Jean-Louis Restaurant at the Watergate. Moist and spongy cake is layered with a custard and chopped strawberry filling, and covered by a slightly sweetened whip cream frosting, which I prefer to the heavy butter cream, and topped with curls of white chocolate. This is a perennial order for my birthday parties, and as much as you want to refuse a slice, “Resistance is Futile” (the Trekkie celebrant would appreciate this). Every calorie from this delectable light bite (texture wise) is worth savoring at least more than just one plateful. Finale: A warm night, a not-so-in-denial mid-centurian, the various tasty and exotic dishes from a distant land, a sinfully good cake, an alluring belly dancer, a genial restaurant owner, sated and smiling guests, wonderfully exotic ambience, and finally attentive service. All these elements made for a perfect celebration for my long-time friend who now has this night to remember. 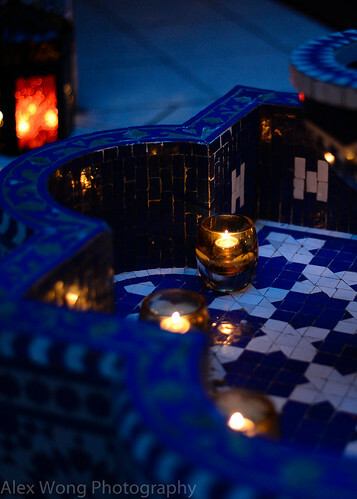 The visit tonight only confirmed to us that Marrakech is worth paying more visits in the future judging by the wonderful experience we had there. Thanks, Rob. It was indeed a delicious meal and wonderful night.